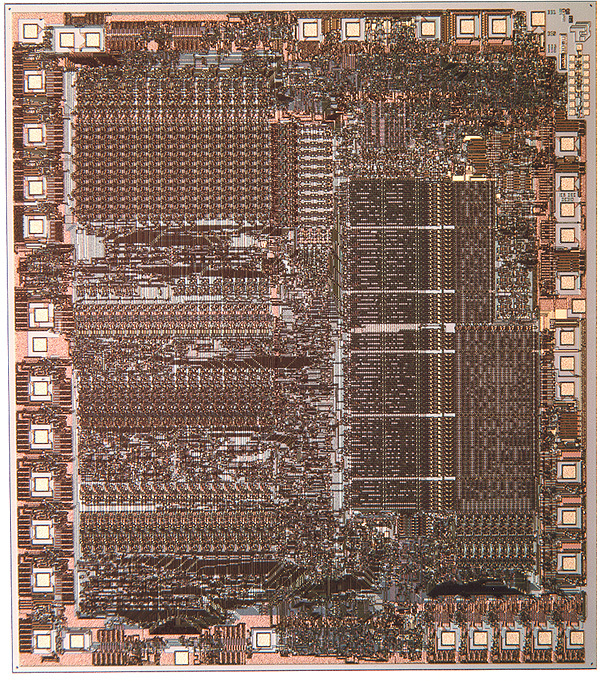 The T-11 (code name Tiny) was DEC's third microprocessor design, and the first single chip design. Rich Olsen and then Mary Ellen Lewandowski were the lead project engineers; Dan Dobberpuhl's consulting company did the circuit design and layout. The T-11 had a substantially different focus than the F-11. It aimed to capitalize on the strength of the PDP-11 in embedded markets by providing a one chip, inexpensive, low-power PDP-11 with a standard interface. Its target markets were OEM's and embedded devices rather than systems. The T-11 had the same feature set as the LSI-11 -- no floating point, no memory management -- but the integer performance of the F-11. It was implemented in a scaled version of the F-11 process -- 5u NMOS -- and operated at 250Mhz (400ns microcycle). The T-11 dissipated less than 1.2W and cost less than $10 in high volume. The T-11 was always a bit of a stepchild in the Semiconductor Group. Because it wasn't targeting systems, it was prioritized lower than projects that generated systems revenue. Nonetheless, after release it was widely used inside DEC for smart controllers (like the RQDX3) and auxiliary processors (like the KXV21), and outside DEC in applications as diverse as arcade games (Atari's Paperboy) and laboratory instruments. T-11 was the last DEC microprocessor to verify the chip layout manually. For several months, I was part of an army of volunteers that crawled over gigantic Mylar plots of the chip with colored pencils and rulers, tracing lines to make sure the wiring was correct, and measuring gates to make sure the sizing was right. Even with only 12,000 placed transistors, it was a tedious and error-prone process. After release, the T-11 team drummed up business inside of DEC by holding a design contest. Entrants were encouraged to design a product around T-11; the winning designs would be fabricated. I designed a T-11 based personal computer than fit inside a VT100 terminal and ran RT-11. Although it didn't win the contest, it was interesting enough to be fabricated. This is the only logic design I ever personally did in my career at DEC.
T-11 was the first chip DEC presented at the International Solid State Circuits Conference (ISSCC). At the 1981 show, T-11 ended up sandwiched between Intel's mammoth "mainframe on a chip", the i432, with more than 1 million transistors in the chip set; and HP's Focus chip, with more than 500,000 transistor sites on a single die. Between these two behemoths, the 12,000 transistor T-11 looked, well, tiny. The Semiconductor Group was very discouraged and vowed that its next experience would make a better impression (it did: in 1984, DEC showed both V-11 and MicroVAX). Ironically, T-11 did far better commercially than either of its ballyhooed session mates. The i432 sank without a trace once its architectural and implementation follies became clear; Focus shipped only a few thousand units. T-11 shipped hundreds of thousands of units and is still running in embedded devices today.